SHOCKJOY is the creative art and design studio moniker founded & operated by Timothy Stroh. The studio's focus on and approach to generating visual content — partnering with select clients in the fields of architecture, art, culture, fashion, music & technology — has developed primarily through years of immersed experience within the direct study and profession of architecture. Stay informed with new product offerings and sales by following SHOCKJOY on twitter! 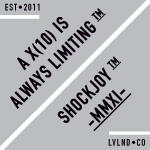 SHOCKJOY is the founder of and sole designer for AXIAL, a streetwear based brand. It is the acronym for A X(10) Is Always Limitng. The brand is dedicated to creating inspiring graphic tees & other goods for those just as passionate in their own life pursuits and adventures. It's based on questioning society's perception of perfection, because a 'Perfect 10' cannot always be a true measure of achievement. It's about making your own mark in the world by simply going forth and creating, and not limiting individual potential or defining worth based upon an existing standard or test. While the flagship of the brand is anchored by a polygonal wireframe-like trademark, alternate, more playful & animate versions emerge from the voided framework thereby metaphorically eluding to and suggestive of an individual's empowering drive to inspire others by their own actions, adventures, or pursuits. SHOCKJOY is the creative director, editor and publisher of Random Act of Type, 'A Contemporary Journal Surveying Randomness Through The Documented Letter: Written, Illustrated, or Otherwise.' The inaugural issue is now available. Providing the studio with a platform for design experimentation, collectible studio edition artwork and prints will be made on an ongoing basis in limited quantities. Typographic illustrations, photographs, and books are a few of the mediums with which studio editions are explored and ultimately realized. Designs, images and project descriptions contained on this site are the creations of SHOCKJOY and Timothy Stroh. Unauthorized use of content, in part or in whole, including copying, distributing, storing of content in an archiving system by any means and/or type, (re)transmission of, and/or modifying of content is strictly prohibited. Do not use content without expressed written permission. SHOCKJOY reserves the right to update, modify, and alter site content at shockjoy.com and the online SHOCKJOY shop (shockjoy.bigcartel.com) without notice, including that of images, texts, audio, and video, and is hereby released from any and all liability and/or damage caused by your visit to and use of this site, including connection to any external third-party links accessed and/or referenced herein. © 2015 SHOCKJOY LLC & Timothy Stroh.